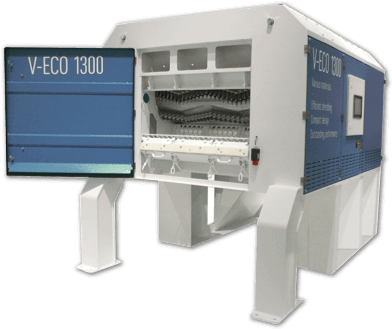 Vecoplan delivers turnkey systems for a variety of specialized aluminum recycling applications. These include shredding of aluminum briquettes, UBCs (Used Beverage Containers), and other waste made of aluminum. Vecoplan technologies are especially adept at recycling bulk scrap consisting of aluminum composites. Aluminum is often used in conjunction with plastics and other materials to manufacture a composited end product. To be efficiently recycled, these materials need to be separated. The inherent interaction between the cutters on a Vecoplan rotor as it turns and meshes against the fixed bed counter knife, not only shreds the composited material but also naturally liberates one material from the other – i.e. aluminum from plastics. Once liberated from each other the materials can then be segregated through a variety of application specific separation technologies offered by Vecoplan. Once separated, the maximum value of each material can be obtained. Vecoplan provides systems that shred, liberate and separate aluminum from other materials found in bottle caps, window and door profiles, foils in composited sheet materials, cables and wiring, heat exchangers or radiators, composite heating pipe, window blinds, light fractions from ELVs (End of Life Vehicles), photovoltaic modules, slag/dross, and other composites with similar properties or characteristics. Contact Vecoplan with specific information on your special aluminum recycling application. Engineers will assess and evaluate this information, conduct feasibility studies, and provide you with data on the best solution to achieve your goals.